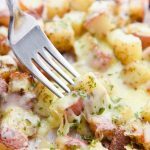 This Roasted Red Potatoes recipe is a cheesy potato side dish that packs flavor in each bite, can be enjoyed with or without mozzarella cheese. 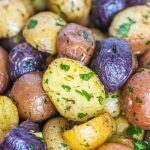 This is an easy roasted potatoes recipe and we like to keep it simple with the seasonings and use a mild flavored cheese like mozzarella. 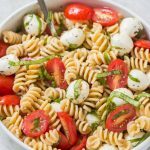 If you don’t like mozzarella you could use your favorite cheese, we also like to use cheddar occasionally. 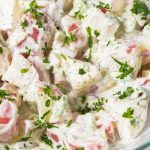 You could even enjoy our Roasted Red Potatoes without the cheese to make this a vegan side dish option. Red skin potatoes are ideal for roasting, soups, stews, mashing, and even salads. You can find big red potatoes and baby red potatoes. 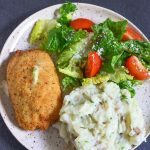 When you use them for mashed potatoes they have a creamy texture and they will still have that creamy texture when roasting, but crunchy on the outside. 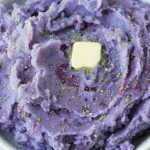 Red potatoes have a waxy texture and will stay together instead of falling apart during cooking. Red potatoes are also referred to as new potatoes. Reds are a great source of potassium, vitamin B6, vitamin C, and low in calories. They are naturally sodium, fat, and cholesterol free. 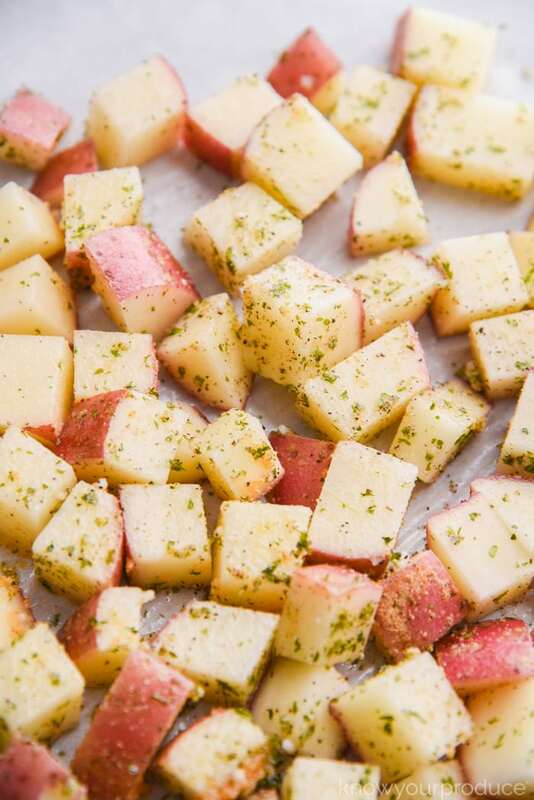 To quick the potatoes quickly in the oven you’ll want to chop them up into bite size pieces. 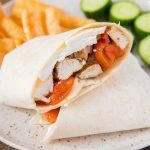 You’ll want the pieces to be comparable in size so they all cook evenly. Want a whole potato? 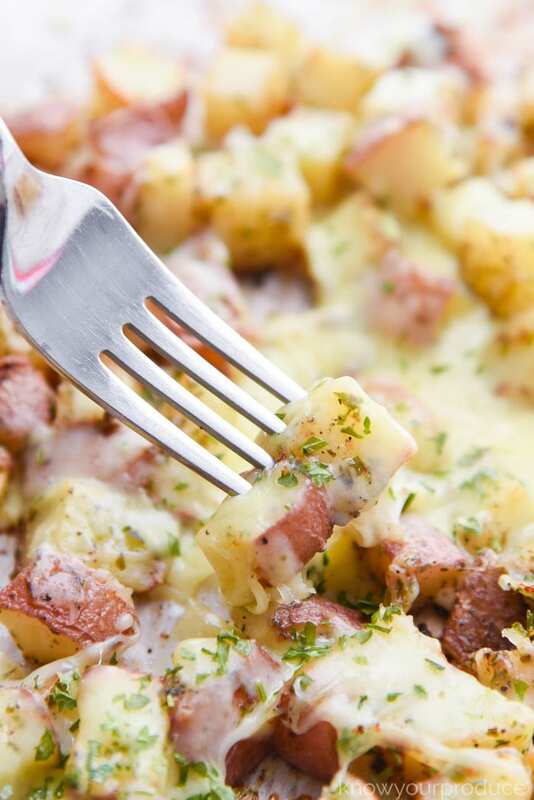 See our post on how to make a baked potato. Once you have all of the potatoes chopped you can place them onto a baking sheet. 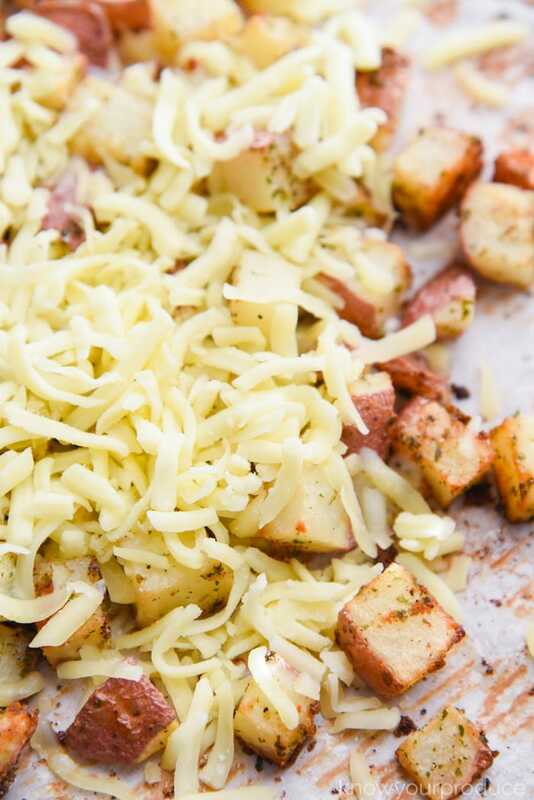 Place the chopped potatoes in the oven to bake until fork tender and then you can top with some freshly shredded mozzarella. 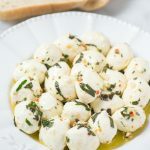 Allow the cheese to melt over them in the warm oven for about 3-4 minutes. 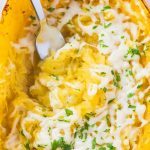 The end result is a delicious and cheesy side dish. When we cook them they’re fluffy in the inside and slightly crisp on the outside, not crunchy. You could make them crunchy if you’d like, but we just prefer to have a softer potato. We hope you enjoy our oven roasted potatoes and if you do try it be sure to tag us on social media using #knowyourproduce on instagram. 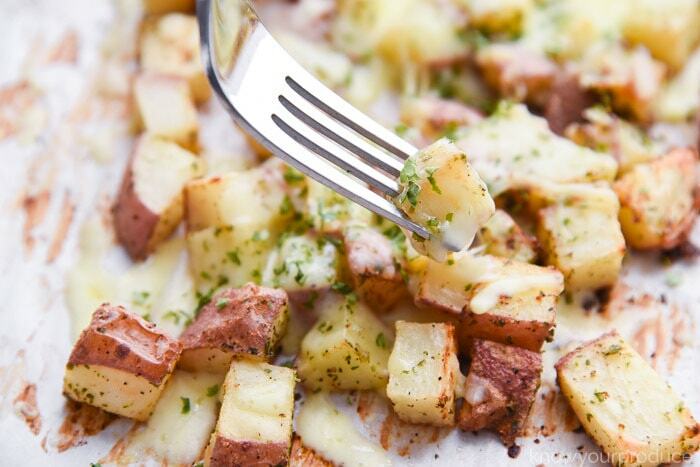 Line a baking sheet with parchment paper and dump potatoes onto it. Mix the potatoes with the avocado oil and seasonings. Spread the potatoes out so that they cook evenly. Bake for 20 minutes or until desired brownness is achieved. 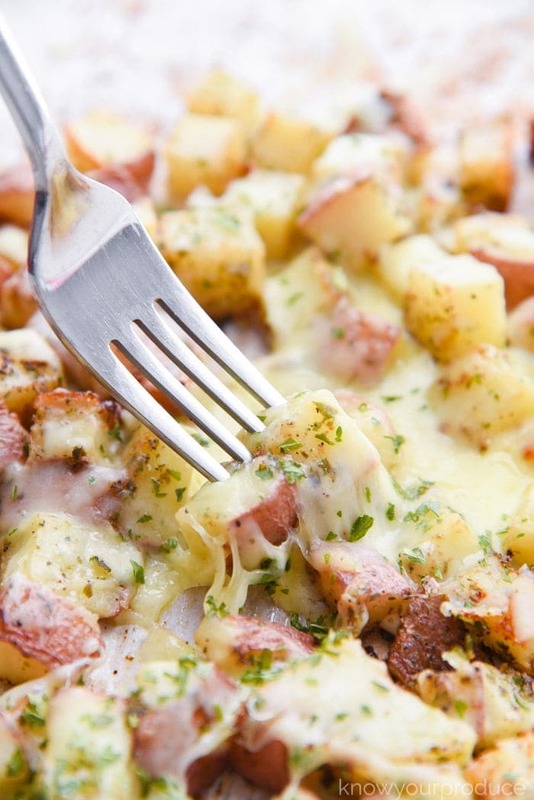 Cover potatoes with shredded mozzarella cheese and place back into the hot oven for 3-4 minutes.